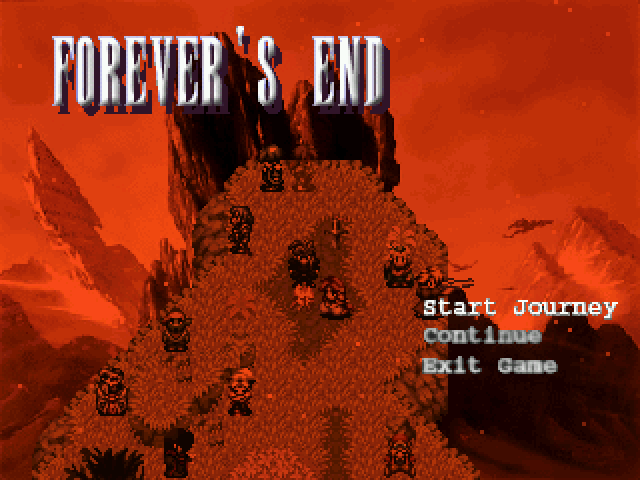 Forever's End is a traditional JRPG that seems to have been in development for as long as its title suggests. In fact, it's been in development for so long that I've reviewed it twice, the most recent of which you can read here. For an RPGMaker game it has overwhelmingly good press, having being reviewed 15+ times with an average rating of ~8/10. It is also an award winning title, being the winner of the RPGMaker.net's "Most Promising Demo" award in 2010 (an award that it beat my own game, Sore Losers: Riot Grrrl, to win) and the winner of RPG-Atelier.net's "Project of the Month" award for June 2011. When you stack all this data up, it's easy to see why I'm hyped about this game, even if I haven't got a clue when the final version will be released! Forever's End is a highly acclaimed JRPG being developed by NicoB. The game itself is pretty standard as far as JRPG games go. You fight battles, solve puzzles, uncover plot details, fight more battles etc. What makes the game so good is how polished all of these gameplay aspects are. Even in the very first demos released for this game, it was obvious that the final product was going to play incredibly smoothly and with the latest release - the entirety of the "first episode" - it's clear that this is the case. The battles are well-balanced and never feel like a chore to play through, and additions such as the monster capture system (capturing all of the monsters in a certan area will unlock rewards from an NPC) spice up even the most mundane of encounters. The maps themselves are well worked, especially those that contain puzzles, and since the battles aren't encountered randomly you are able to fully enjoy each puzzle without having to worry about getting stuck in a battle half-way through trying to figure it out. The encounter system itself is pretty clever, since you're able to sneak up on enemies to gain an advantage in battle if you're careful enough. It's a system that's been used to great effect in other games, games like the Grandia series, so it is hardly ground-breaking... but that doesn't stop it from working! The game features impressive, comic-book style cutscenes that look truly amazing. Forever's End, along with Feldschlacht IV's Chronology of the Last Era, is one of those RPGMaker games that seems to have been in development for ages. I don't want the developers to rush what they're doing because it might make the games worse, but sometimes I want the finished games now! I've never heard of this before, but I'm intrigued now! Retro gaming is always fun. Those are some amazing cutscene graphics. I'd rather have a great story and great thought going into a game than pretty pictures. Dude, how do you find these? Now I want to play this! lol. Hm, looks like I might just have to play this for the cut-scenes... They look brilliant! Looks interesting. Like the cutscene picture. Agree AE, it does look good, I'll give it a dl. Wow, those cutscenes alone look like they are worth buying it for, so good. Retro gaming is pretty much the only kind I'm interested him. This might be a good one, too. Seems like you really appreciate games where their developers aren't cutting corners. Thanks for the shout out F-G. I honestly didn't know you had written this until I did a recent google search. I'm happy to hear you're still looking forward to its completion, and I'm doing my best to get it done quickly without cutting any corners.